Come and learn to spin. 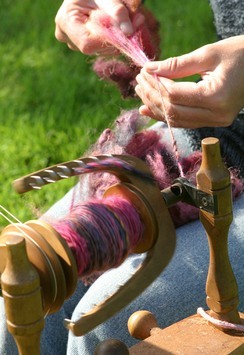 By the end of the day you’ll have your own hank of hand-spun wool to take home with you. I provide everything you need, including lunch! Are you using your spinning wheel to its full potential? A day spent with me might be just what you need to fully appreciate exactly how it works. 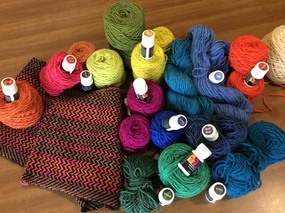 I can show you how to get the most from your wheel and how to spin precisely the yarn you have in mind, whether it’s thick wool for weaving rugs, thinner yarns for knitting, crochet or unique designer and novelty yarns. Do you want to weave your very own piece of fabric? I have a variety of looms you can use. If you’ve never done it before it really is quick and easy. 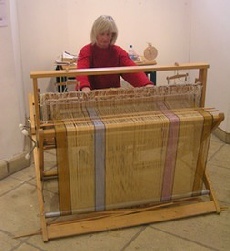 You can prepare a loom in the morning and be weaving your scarf, table mat, cushion cover or bag fabric in the afternoon. It’s advisable to spare two days for weaving because then you’ll have plenty of time to absorb the intricacies of weaving as well as weave your chosen project and I can show you some interesting finishing techniques. Maybe you know how to weave and have your own loom? Would like to learn a new weaving technique or reinforce your existing skills? I can give you guidance and share my experience with you, so you’ll go home with your head buzzing with ideas and inspiration. I love dyeing with plants from my garden as well as using synthetic dyes because they give your yarns, fibres and fabrics a degree of individuality reflecting your personality through the colours. I can show you how to use natural dyes. It’s a wonderful feeling using plants from your garden or from hedgerows to give you beautiful colours. I also use special dye plants, such as indigo, logwood and cochineal because you get really good strong repeatable colours which are difficult to get from our indigenous species. 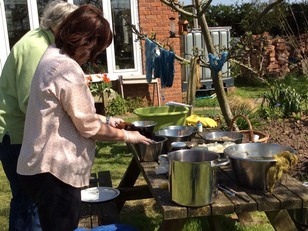 The best way to learn all about natural dyeing is to do a 3-day course with me because then I can show you how to do it in the most environmentally friendly way. You can bring your own ready prepared yarns, fibres and fabrics or choose from my collection. You can either come on three consecutive days, or space them a week or two apart, depending on your diary commitments. I try to be as accommodating as possible! My particular style of dyeing is fun, quick, easy and very colourful and colourfast. If you’d like to come and learn all about using synthetic or chemical dyes which give wonderful bright vibrant colours, treat yourself to a day with me. I’ll provide all the equipment and materials required for the day. Just come and absorb all my knowledge which I’ll willingly pass on to you and take away a selection of samples. By the end of the day I’ll have put chemical dyeing into perspective and you'll have a better understanding about the different dyes available for different fibres. This is a really easy, fun, tactile activity for both children and adults. You can come and make a simple picture, you can incorporate lots of pictures into one finished wall-hanging or large mat, or create a 3-D sculptured piece. Your imagination is the limit! 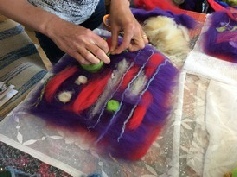 I offer felting days to schools which are very popular. Knitting and crochet are such simple activities. 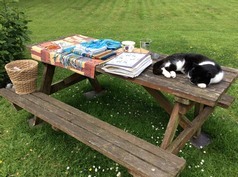 I can teach you how to knit or crochet if you’ve never done it before or I can show you specific stitches to help you improve your skills and produce interesting items like a möbius or twisted scarf, felted knits, bags, patchwork cushions and blankets etc. It’s lovely to be able to incorporate knitting and crochet into the same piece of work. Silk can be used to make beautiful fabrics which you can further embellish. If you decide to come on a silk paper workshop you would spend the first part of the day learning about silk sericulture so you’ll have a finer understanding of the variety of silk fibres which exist. Each one has its own characteristics and will therefore give you a different kind of silk paper. The technique is simple, with interesting effects. You can either make 2-D pieces for book covers, wall-hangings, curtaining, screens etc or if you’re feeling adventurous you can make 3-D bowls and beautiful sculptures. 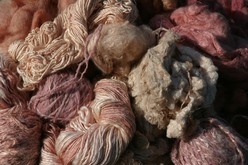 Silk is soft, lustrous, light and strong and takes up dyes very easily. "Somebody asked me to make a crochet hat for an Abba night - would you believe - and one of your instructions came into play, casting off with a smaller hook. I enjoyed making it with lots more confidence than before the course." "Thank you for an absolutely fabulous day yesterday. I enjoyed every moment of it and learnt so much. You certainly packed a great deal into the time and we didn't waste a minute - I was thoroughly exhausted when I got home and slept all evening! I hope I didn't have the same effect on you! " "Many thanks for a great course. I learnt a lot in such a short time and am looking forward to continuing with felt-making." 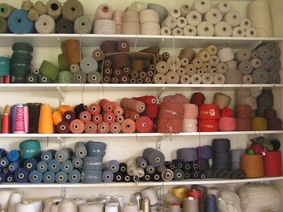 are available for textile workshops as well as equipment and materials. Ideal for Birthday and Christmas presents or other special occasions.